How can Google Docs and markdown play nice? I love Google Docs. I write notes, essays, correspondences, invoices, journal entries, business ideas, planning documents- everything on there. I also love the markdown format. I'm a programmer so sometimes I'm in my editor and just want to write things in markdown instead of going to Google Docs. However, when I save my markdown files in Google Drive, I can't preview them there, which is extremely disruptive to my workflow. 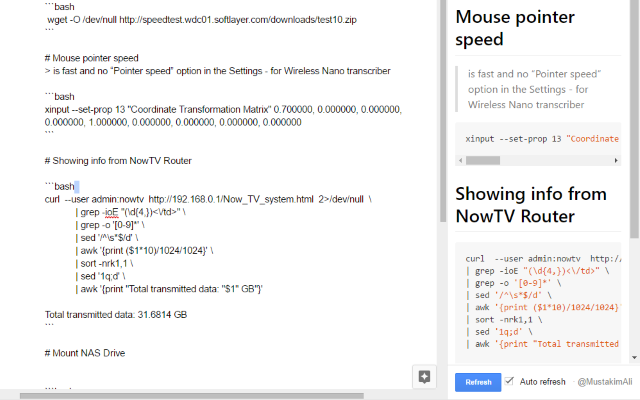 Being able to preview markdown files in Google Drive would be a huge improvement. Is there any way to enjoy the benefits of both Google Docs and markdown? Or are these writing platforms largely incompatible? Any elegant solutions I'm not thinking of? You can give StackEdit a try. It has a nice integration with Google Drive. Once you import/export a Markdown document from/to Google Drive, you can open it later directly from Google Drive since StackEdit is integrated as a third party editor/viewer application. You can find StackEdit as a Chrome application as well on the Web Store. NOTE: I'm the developer of StackEdit. A Google Docs document encodes everything in 'elements' within the Kix editor that it's all based on (it's closed source as basically this is the big trade secret, with which anyone else could run their own Docs service - which is a shame imo). When I came to do this earlier in the year there were dozens of forks of Renato Mangini's "gdocs2md" repo, but he seemed to have stopped fielding pull requests, and over the period of a few years forks had appeared that were far better than others. I went through many of these in the tree and put the best into a new package, which also generates HTML mixed with the markdown for elements Google Docs supports such as superscript and subscript elements (which markdown has no way of representing). Even incorporating the best of others' edits, the parsing needed work, and I'm confident that this is the best available for the job at present. I also worked on adding in the most important feature to such a script - user features - providing the markdown in a pop-up within Google Docs rather than saving to file (I think the original was batch saving for entire folders, which is not suitable for my document-drafting needs, or how I use Google Docs at all). I'd like to suggest it be a single more sophisticated project for interested developers to collaborate on (or at least suggest features for) rather than everyone forking off scripts of various quality, when we're likely working to the same aims. Obviously if you wanted a "pure" markdown then either switch off these features (the code is there to fork) or just don't use sub/superscripts, etc. It wouldn't be too difficult to add personalised settings to such a script if it matures as an add-on, if there's significant interest. You can convert a Markdown document to HTML, and copy/paste the HTML page (not the source) into a Google Drive document. It will retain most of the formatting including headings, lists, links, bold/italic/underline. The font, margins, and font sizes will not match the Google Drive defaults, and will look "out of place" compared to standard Google Drive documents. Applying a custom CSS file to the HTML document will solve this, making the document look very similar. I'm not sure about the other direction, converting Google Drive documents to Markdown. It may be possible to export to HTML and use an HTML to Markdown converter. gdocs2md does a good job of converting Google documents to markdown, retaining headers, lists, tables, italics, bold, links and images. I use it to allow shared editing of documents, then export to markdown. Some care does need to be taken to use formatting in the Google document that maps well to markdown, but this isn't particularly difficult. I've also extended the script to support exporting an entire folder of documents to a new "export" folder on Google Drive, and to slightly improve handling of italic and bold formatting, my fork is here. You say you're a programmer, so this answer assumes you'd be comfortable with a little "roll your own" approach. So, you could create a little Showdown viewer that you point to your markdown files (as URLs). Download and install the Google Drive software. It's for Windows and Mac at the moment, a version for Linux is in the making. The software will create a folder on your computer that syncs with Google Drive. If you open a file in it, it will be opened in the appropriate installed program. Google Drive documents that you open will open in the browser. This way, you can open/edit markdown files stored on Google Drive in an installed markdown editor. 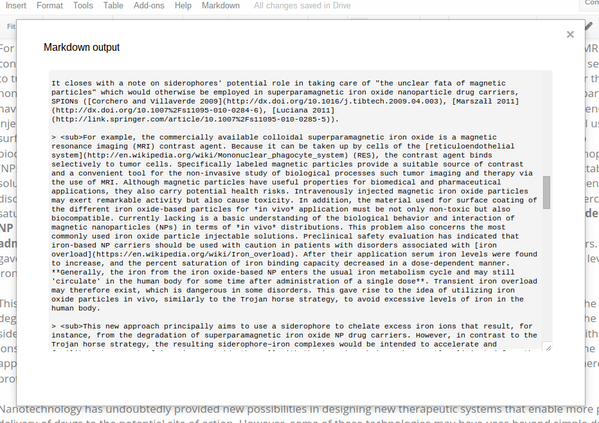 I recommend Markdown Preview Is a simple Add-on that (just) makes previews of the markdown document you are creating. As far I understand, the main request is to preview it, so I think this is what you are searching for. Preview Markdown Add-on for Google Docs gets my work done, it shows markdown preview in realtime in the sidebar with syntax highlighting. I like to use Google Docs and I love the simplicity of markdown even more, that is why I put together showdown.js and highlight.js to create this small add-on. Create your mark down wherever's convenient. Google docs is ready to have HTML pasted in so it'll preserve all the headings, spacing, lists, and other formats. Of course this only makes sense if you just want to personally work in markdown, but collaborate with others in a regular google doc. Strangely enough, Tumblr interconverts rich text, HTML, and markdown. I have had success in all directions, including taking markdown generated in Typora, pasting into a Tumblr post in md format, and then converting to rich text. Rich text can be pasted into Google Docs. Then, merely upload to Google Drive. In Google Drive, right-click and choose Open with Google Docs. Not the answer you're looking for? Browse other questions tagged google-drive markdown or ask your own question. Is there a way to allow markdown style code snippets in google docs? How can I embed gist snippets using Tumblr markdown? Can I turn off Markdown in Trello? How can I backup my Google Drive files using Time Machine? Markdown formatting in Google Keep? Shortcut for creating Google Docs file in Windows?